The bold and bright patterns in the Mantra rugs make them a real statement flooring option for your home. Highlighted with rich reds and deep purples - not to mention the vivid greens and blues that they contain – it’s easy to match accessories in your home such as over-sized cushions or a seasonal flower arrangement to create a stunning space. The rugs are machine woven from top quality materials and will remain bright and bold for many years to come. Just because we call these rugs cheap doesn’t detract from the quality workmanship and yarn that goes in to making them. 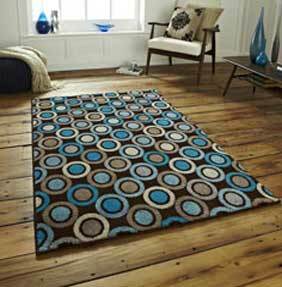 So if you are looking for a hard-wearing, high-quality rug then look no further.